Presentation of draft cannabis license application and criteria at West Hollywood City Council Chambers. 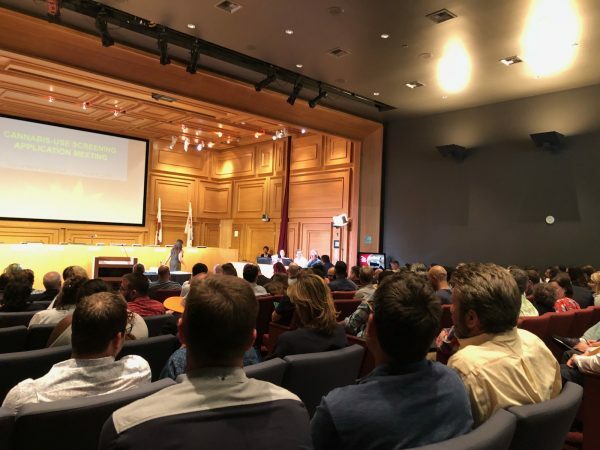 A standing-room-only crowd turned out this afternoon for a presentation at the West Hollywood City Council Chambers of a proposed process for applying for one of the city’s 40 cannabis-related licenses and of the criteria that will be used to decide who receives a license to operate in West Hollywood. The crowd included prospective applicants from within and outside West Hollywood as well as locally prominent lobbyists such as Jeff Seymour and attorney Mark Lehman and WeHo Chamber of Commerce President Genevieve Morrill and several Chamber board members. Jason Beck, the owner of Alternative Herbal Health Services, one of the owners of the four currently licensed cannabis businesses in West Hollywood, also attended the meeting. Asst. City Attorney Lauren Langer presented the criteria that an independent board of examiners will use to decide which applicants qualify for one of eight licenses in five categories: Recreational cannabis sales, medical cannabis sales, WeHo-based cannabis delivery services, edible cannabis consumption lounges and cannabis smoking or vaping lounges. The complex process requires a review of eight areas that include 58 specific criteria that the board of examiners will award points for. Those areas range from the quality of the applicant’s business plan and his or her plans for the operation and security of the business to the applicant’s willingness to support the city’s progressive values by working with small cannabis producers and purchasing cannabis from cultivators in poorer counties. Other social criteria include reaching out when hiring to veterans and LGBT people and others who might find work hard to find and also engaging with local businesses and non-profits in a way that shows the applicant is interested in connecting with the community. The maximum number of points awarded is 200. Given that, the most important area for evaluation is the applicant’s business plan, where a maximum 90 to 105 points can be awarded depending on the type of license sought. Twenty of those business plan points are tied to social equity issues such as paying above the state minimum wage. The security plan for the business can earn up to 40 points. Security is especially important for cannabis businesses because they generally are conducted solely in cash. That’s because the sale of cannabis, while legal in California, is a violation of federal law and banks and credit card companies don’t want to risk being cracked down on by federal authorities for handling credit card and check payments. The design of the interior and exterior of the proposed lounge or retail or medical dispensary space can earn an applicant up to 40 points, with the exception of those applying for delivery licenses, where the maximum is 25 points in that category. Experience managing a cannabis business or another state-regulated business such as a bar could earn an applicant up to 25 points. Those attending the meeting asked a range of questions, with most focused on understanding the details of the complex process. John Leonard, the city’s manager of community and legislative affairs, said the questions and suggestions would be taken into account as the city reviews the draft criteria and application form, both of which currently can be found on the city’s website. The city expects to release the final application form and criteria next week. In response to questions, Langer said that every one of the applications filed will be reviewed by each of the examiners. Leonard said that the names of those examiners will be made public soon. He said each was chosen based on his or her individual expertise in areas such as cannabis sales, the entertainment industry, design and architecture and knowledge of West Hollywood. Leonard noted that the City Council has agreed to bar its members from interacting with the examiners and applicants also cannot contact them. Responding to a question from Larry Block, a local business owner, Langer said that it is possible for one person to have a stake in multiple businesses applying for a license. However, one business cannot apply for more than one license in each category. The four existing medical cannabis dispensaries in West Hollywood have been given temporary licenses to sell recreational cannabis but must formally reapply for those licenses. They will not be required to file applicants for medical dispensary licenses, but the board of examiners will evaluate them along with applicants in that category to decide who ultimately will get those eight licenses. One speaker drew applause from the audience when he objected that the criteria seemed to give an advantage to the four existing cannabis businesses. The criteria state that “an existing West Hollywood cannabis business that has no outstanding code violations with the city and is in compliance with local and state laws” will be awarded five points. Leonard said City Hall staffers would discuss his concern. Applications can be filed online from May 2 through 31. Applicants for WeHo-based delivery licenses will have to pay a fee of $5,025 and applicants for licenses in the other categories will have to pay a fee of $9,880. The city is expected to decide who will receive licenses during the Summer, at which point those applicants will have to secure a location, get the city’s acknowledgment that that location is in an appropriate zone and then obtain a state license.